Canberra, the nation’s capital, was a town built ‘for the government by the government’, but by 1970, with most of the Commonwealth government departments established and the public service transfer program slowing down, it was also a town struggling to find its own identity. Prime Minister Malcolm Fraser suggested that while we continue to forge ahead as a symbol of Australia’s national identity we would be better served by establishing a local identity. Learning to lessen our reliance on Commonwealth funding and increase our independence would prove challenging and would require a concerted effort on behalf of all residents, local business and the federal government. To this end, in October 1979, the ‘Canberra Means Business’ campaign was launched. Designed to address the question of how to attract business to Canberra, the campaign was kicked off with a seminar sponsored by The Canberra Times that included an international guest and government and local industry representatives. The campaign would continue to drive progress in Canberra for the next decade, addressing shortfalls in tourism, economic policy, planning and local industry. Papers relating to the 'Canberra Means Business' campaign are ArchivesACT’s June Find of the Month. Canberra in 1979, under the direction of the Minister for the Capital Territory, The Honourable Bob Ellicot, was wearing the mantle of the Nation’s Capital with pride, with construction of buildings for some of our most well known national institutions in progress. The competition to build a new parliament house was underway, the National Archives was moving to a new building, and feasibility studies were underway to extend the National Library, and to build the law courts on London Circuit. Research was being undertaken into a National Museum. The High Court was close to completion, and the National Gallery was not far behind it, with completion scheduled for 1981. In February 1979, a group of prominent local businessmen took initiative into their own hands and united to explore new ways to stimulate economic growth in the region. Representing industry, businesses and local government from Canberra and Queanbeyan, they branded themselves the ‘Committee of 22’. The committee lobbied the government to explore the potential for new business with the aim of establishing new industries, providing jobs and stimulating growth in the Territory. Canberra needed a fresh approach to development if we are to correct the current imbalance between public sector and private sector in Canberra or achieve an integrated promotion of the region. The Canberra Development Board aimed to identify new opportunities to benefit Canberra, promote Canberra to the wider community and offer advice to the government on areas requiring development in order to attract new business, families or tourists to the region. The inaugural chair was Sir Lawrence Muir and he served for the first eight years. Muir was already well known for his support of business in Australia, having helped establish both the Australian Innovation Corporation and the Australian Business Council. With momentum growing, and the major players in place, the Canberra Times sponsored a seminar to promote public discussion. ‘Canberra Means Business’ would become a key campaign over the next ten years. The first seminar took place at the Lakeside International Hotel and it included an international guest, Mr Shelby Dill, the executive director of the Economic Development Department of the Colorado Springs Chamber of Commerce. Mr Dill was invited to speak about changes in his home town, a town similar in size to Canberra, which had been successfully reinvigorated by introducing economic strategies in the early 1970s. Tickets for the seminar were available through the Canberra Times and the demand was high. The Canberra Times hailed the seminar as a great success. Several priorities were identified as a result of the discussions including: increasing tourism; promoting national institutions; continuing construction goals; and establishing new industries. Technology industries were considered especially suitable. Mr Dill raised the importance of marketing as a secret to his own success, and his speech generated local debate on its merits in relation to the Australian culture. The Commissioner of the National Capital Development Commission, Tony Powell, used the opportunity to speak of the required commitment and involvement of residents. Minister Ellicot’s opening speech drew on his love of the city and the work that had already been undertaken to make it great. His speech would prove to be his last in his role as our minister, however, and a few months later his successor Minister Michael Hodgeman continued his work endorsing “with enthusiasm” the 'Canberra Means Business' campaign and supporting the mission of the Canberra Development Board. Encouraged by the overwhelming success of the conference, the Committee of 22 then formed subcommittees who took responsibility for encouraging initiatives in the following areas: finance; advertising and promotion; local industry; interstate and overseas industry; planning; and tourism. The Canberra Times continued their support of the campaign, running biographies of the committee chairmen including Arthur Kenyon and Bill Cross, King Leggett and Kevin Boundy, Laurie Burgess and Gene Bridge. Local businesses contributed financially, producing and distributing 3000 'Canberra Means Business' stickers to the community and a 15 minute documentary ‘Answer Canberra’. The private sector also provided funding through investment in local developments including the Jolimont Tourism Centre and the Argyle Square apartments development in Reid. Based on feedback from the Committee of 22, the commercial leasehold system was changed to enable businesses to enter into 99 year renewable leases. Leases for national not for profit, industry and professional bodies were also addressed, offering institutions better value for money through negotiation and thus enticing them to choose Canberra to set up their national headquarters. The Canberra Development Board sought out submissions for a new international hotel and licensing for a casino. In 1981, at the follow up seminar 'Progress ‘81', Muir commented on the ability of Canberra to host and attend international events and the benefits of both to a community. He was particularly keen to see the convention centre up and running and suggested a partnership between private industry and the government. The Board was also pursuing several international technology based companies as identified by the campaign seminar, citing jobs as one of their man focuses. The Fern Hill Technology Park was established in Bruce and the lure of the government, themselves a huge consumer of technology, proved enticing to many companies in the mid to late 1980s. The Canberra Development Board claimed that the industry doubled in the years 1981-86. 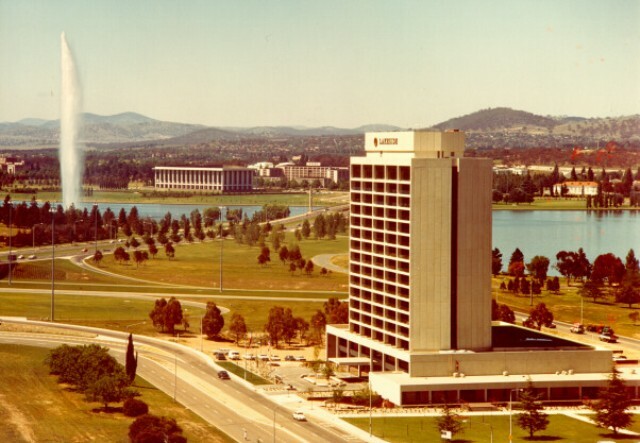 Tourism was on everyone’s agenda, the government committed additional funding to the ACT Tourism Board, and for the first time in 1980 a professional company was brought on-board to help market and promote Canberra to the nation. The most significant achievement by the Canberra Development Board would be their winning bid to host the World Athletics Cup (IAAF World Cup) in 1985. This unique opportunity generated an estimated 250 million dollars into the local economy and provided the region with a promotional platform into the world tourism stage. 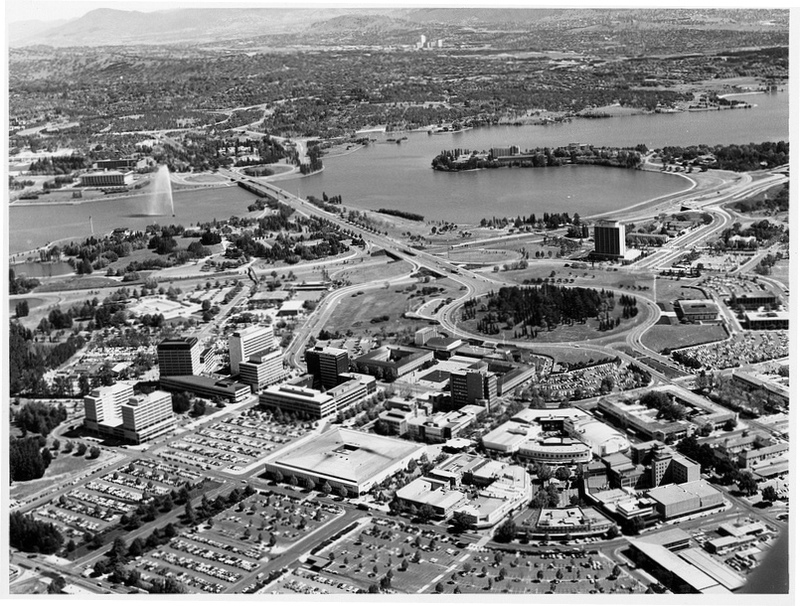 In 1987 with the bicentenary around the corner, Price Waterhouse Urwick were contracted to undertake a study of Canberra’s potential as a short trip destination. Their findings showed some improvement to the issues that were identified in 1979, including an increased awareness of Canberra as the home of cultural institutions and an appreciation for its role as the nation’s capital. Unfortunately it also highlighted some issues that had not been addressed. A limited range of accommodation, restricted shopping hours and the confusing road system were identified as requiring some thought. Private industry was also working on tourism, pushing development on new hotel and dining facilities and releasing tourist guides in support of local traders. 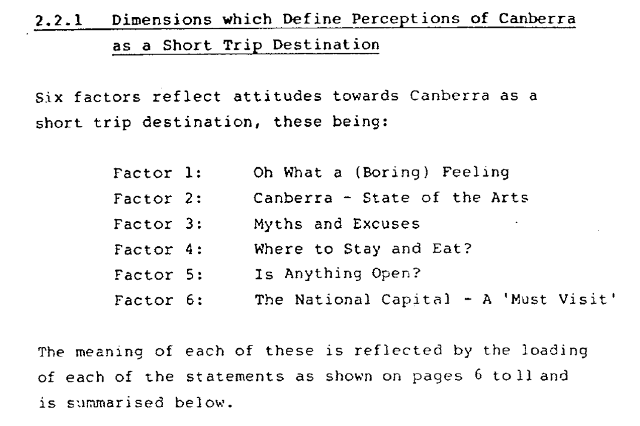 One of the issues identified in ongoing tourism surveys was transport to and from Canberra. In the 1987 'Canberra Means Business' seminar, Nicolson reported on the Very Fast Train (VFT) project, in which a consortium of private companies had been formed to investigate the feasibility of a VFT to provide express train services between Sydney and Melbourne via Canberra. The group based their project around findings from the CSIRO that the XPT service between Canberra and Sydney was poor when compared to overseas standards. The consortium believed that a VFT service would have positive results on the local job market, generating up to 2000 local jobs and having a profound influence on “the pattern of transport, living, cultural and business links, and recreation’ in the region. The headquarters for the project was proposed to be placed in Canberra or Queanbeyan, which would also involve the addition of a new industry and international business links. 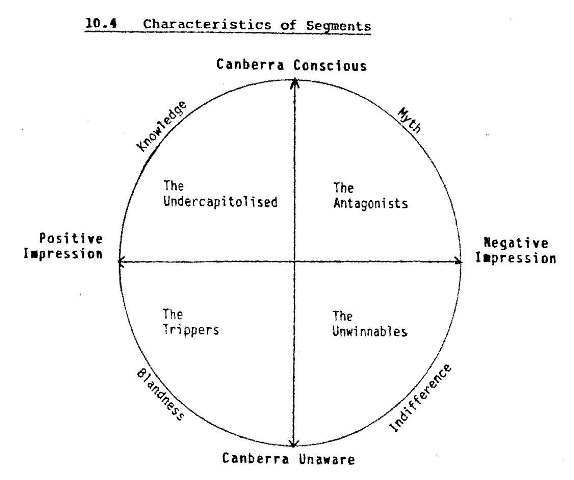 The 1987 seminar would prove to be the last for the “Canberra Means Business” campaign. The seminars ran for almost a decade and served to open dialogue between a broad range of with an interest in the region, to share our potential with the world, encourage tourism, new technology industries and major projects such as the VFT. However, the establishment of self-government, long running arguments over the development of a casino, and disagreements between lobbying groups on other town planning issues saw a breakdown in the communication that the campaign aimed to inspire. The ‘Canberra Means Business’ campaign inspired early collaboration toward a common goal, the economic growth, promotion and development of Canberra and the Region . This philosophy is reflected today in the work of the CBR Innovation network (CBRIN). CBRIN brings together some of Canberra’s finest innovators to collaborate on opportunities for innovation support in our reqion. . The CBR branding is just one of their strategies. If you have recently attended a Brumbies match, you just might have noticed it in action! If you are interested in finding out more about the 'Canberra Means Business' campaign, or you would like a copy of any of these records please contact ArchivesACT through our “Request a Record” service. National Library of Australia (2017). Our building: http://www.nla.gov.au/about-us/our-buildingNational Archives of Australia (2017).